Dopo anni di ricerca senza frutto, nel maggio 2017 il Grac conosce Piero Ricci di Gropello Cairoli (PV), che in brevissimo tempo risolve il problema. Grazie a Piero ora si potrà consegnare il braccialetto di Richard﻿ a sua sorella Therese. After years of fruitless research, in May 2017 Grac meets Piero Ricci of Gropello Cairoli (PV) who, in a very short time resolves the problem. Thanks to Piero now Richard's bracelet can be delivered to his sister Therese. "Quando ho incontrato Cristiano per la prima volta a maggio del 2017, dopo il racconto dell'emozione nel ritrovamento del bracciale, ma contemporaneamente la frustrazione per gli scarsi risultati nella ricerca dei leggitttimi parenti di Richard Perzyk, ho deciso di aiutarlo utilizzando i miei canali sviluppati in diversi anni di lavoro presso aziende statunitensi. Il cognome Perzyk di chiara origine polacca risulta tuttora molto limitato (altra cosa sarebbe stata cercare uno Smith) e tuttora concentrato nel Michigan area di provenienza di Richard. I primi contatti sviluppati tramite i canali mediatici di Facebook e Linkedin sono risultati infruttuosi. Allora ho cercato di sfruttare altre fonti, rivolgendomi alla Chiesa Mormone detentrice del piu grande database genealogico del mondo. Mentre gli stessi svolgevano le ricerche che poi risulteranno fruttuose per confermarci la nostra scoperta, notai che Tim Perzyk, che risiede in California e un alumnus di Harvard Business School, come me. La comunità di Harvard é infatti una enorme e straordinaria ragnatela di contatti mantenuta viva ed utilizzabile tramite un database disponibile a chiunque abbia completato gli studi. Ho pertanto sfruttato questa opportunità individuando il numero telefonico di Tim Perzyk, che ho raggiunto mentre si trovava in vacanza in Francia. 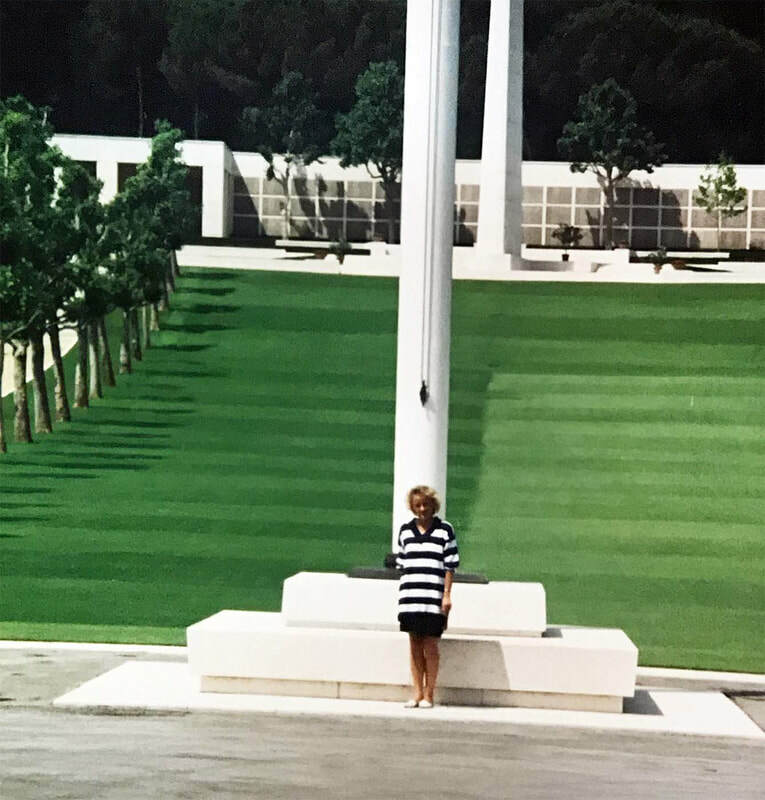 Tim, sebbene perplesso all inizio, quando ho menzionato che la telefonata si riferiva ad un suo antenato aviatore morto in Italia nel 1945, ha immediatamente riconosciuto la storia..."
"When I met Cristiano for the first time in May 2017, after hearing the emotional story of how the bracelet was found, but at the same time feeling frustration for the poor results in the search for Richard Perzyk's relatives, I decided to help him using my channels developed over several years of work in US companies. 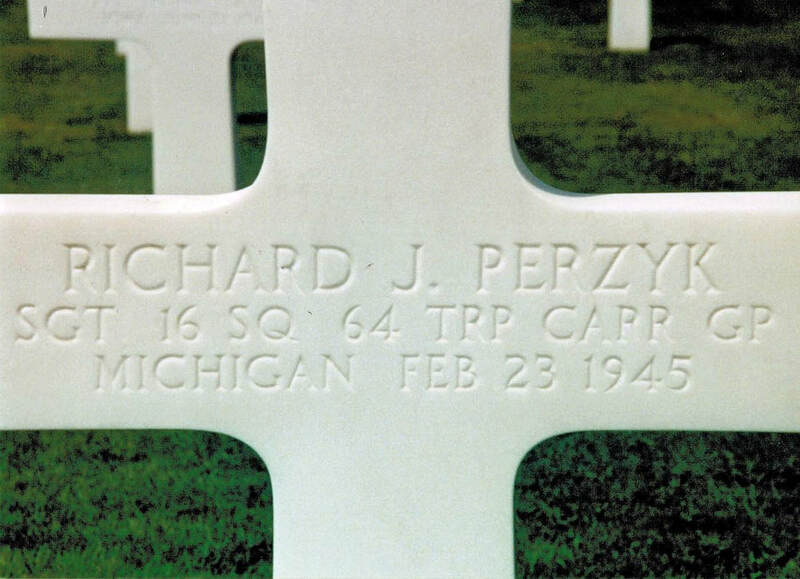 The Polish name Perzyk is still very limited (it would have been different looking for a “Smith”) and is still concentrated in Michigan, Richard’s home area. The first contacts developed through the media channels of Facebook and Linkedin were unsuccessful, so I then tried to exploit other sources, addressing the Mormon Church, holder of the largest genealogical database in the world, and while they did the research that would prove fruitful to confirm our discovery, I noticed that a Tim Perzyk, resident in California, was a Harvard Business School alumni, like myself. 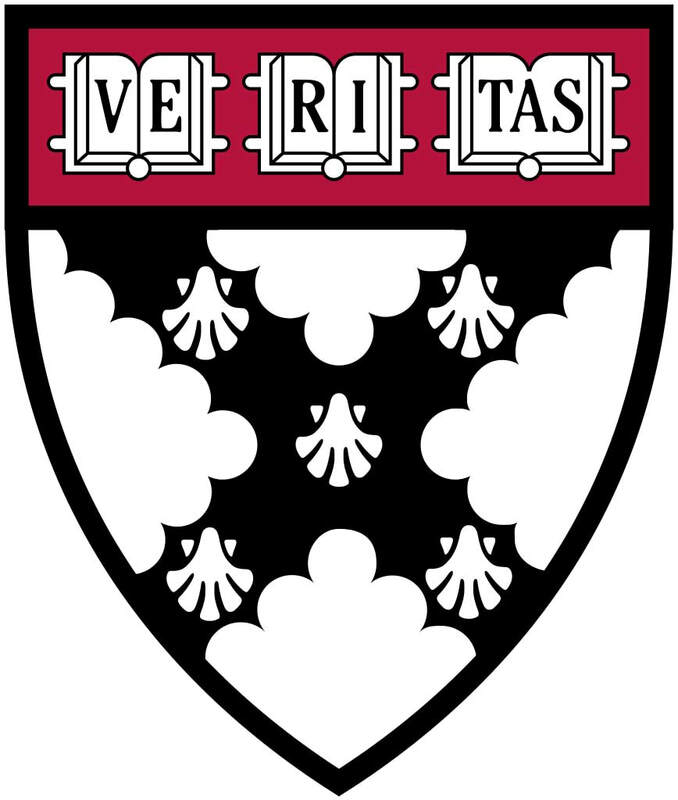 The Harvard community is indeed a huge and remarkable web of contacts kept alive and usable through a database available to anyone who has completed studies there. I therefore exploited this opportunity by identifying Tim Perzyk's telephone number, and called him while he was on vacation in France. 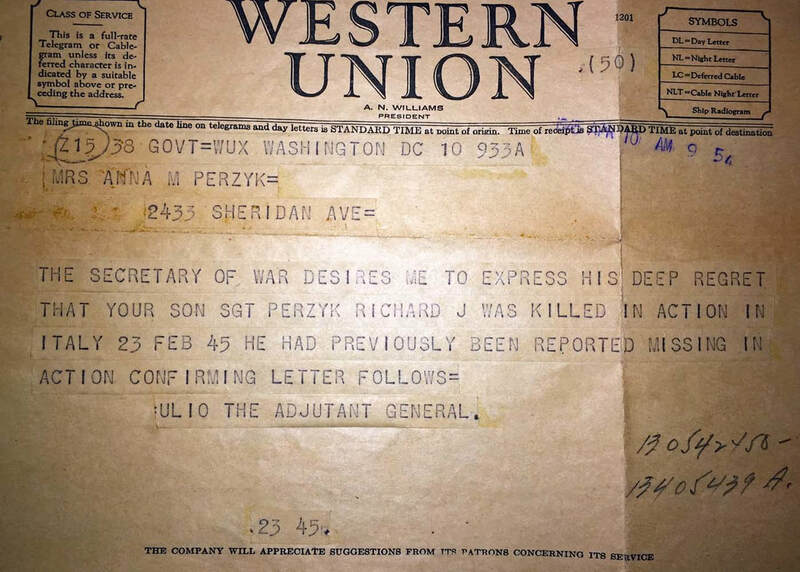 Tim, though puzzled at the beginning, when I mentioned that the phone call was about his airman ancestor who died in Italy in 1945, immediately recognized the story ... "
"I am writing to you about the bracelet that Arrigo and Pierlino found, Richard J. Perzyk. 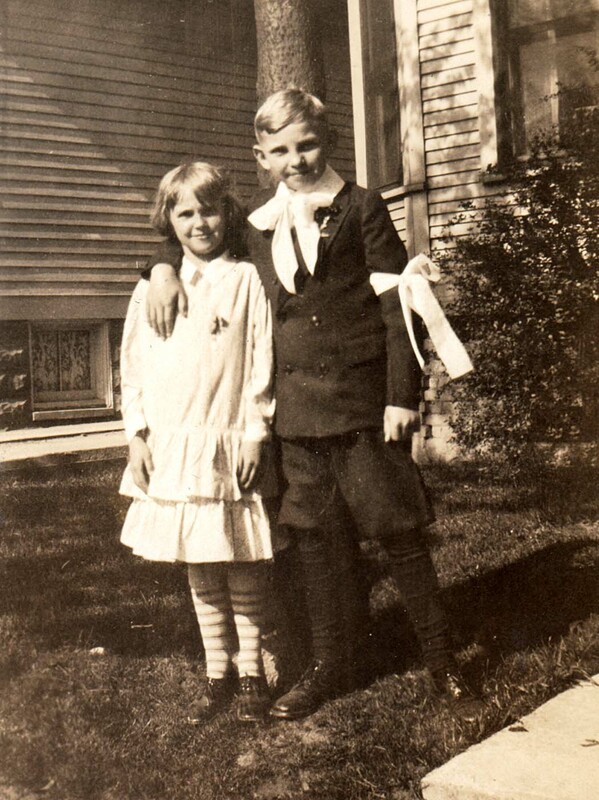 You contacted my cousin Tim Perzyk and are returning the bracelet to Richard's only remaining sister, Therese. I cannot thank you for what you did. I know it will mean a lot to her. She recently gave me the box of his personal effects that I have framed in my office. I have been to his grave site in Florence. As well I have all the original letters that were sent to his mother regarding his accident. I would love to chat with you more about this! One day I hope to be able to travel to Zavattarello and see the crash site. Please contact me so we can talk more! 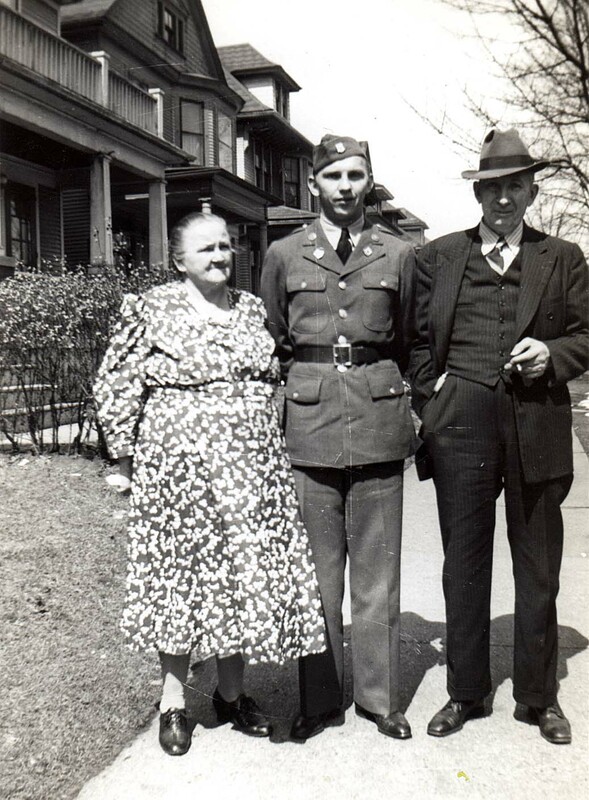 great grand nephew of Richard Perzyk"
and democracy. On behalf Of Grac ( Group of Resarch for Crashed Planes ). It is an honour for us to have found you after a lot of research, as you can see from the site. First, let us introduce ourselves. We are a group of enthusiasts who, our spare time, are dedicated to historical research, and as you will see from our site, the finds have been numerous. In the case of the find of Zavattarello, and then after having found the bracelet, inevitably we were committed to finding a relative to close the ring of events. We would be delighted to talk to you, and some of us are fluent in English, so we could definitely arrange a conference call. We would then like to complete our page with Richard's photos or documents so if possible please send us some scanned information. Finally, for the returning the bracelet to you, we would really appreciate if you or someone delegated could come here. We would like to organize an official event for this. We believe that the local authorities would be happy to organize a reception for you. We think it would be the most respectful way to honour Richard's memory. At the end of 2010, the nephew of the co-pilot Faull who works for US Defense in Sacramento, came to Zavatarello, as a guest of the local Council. They had intense 3 days. 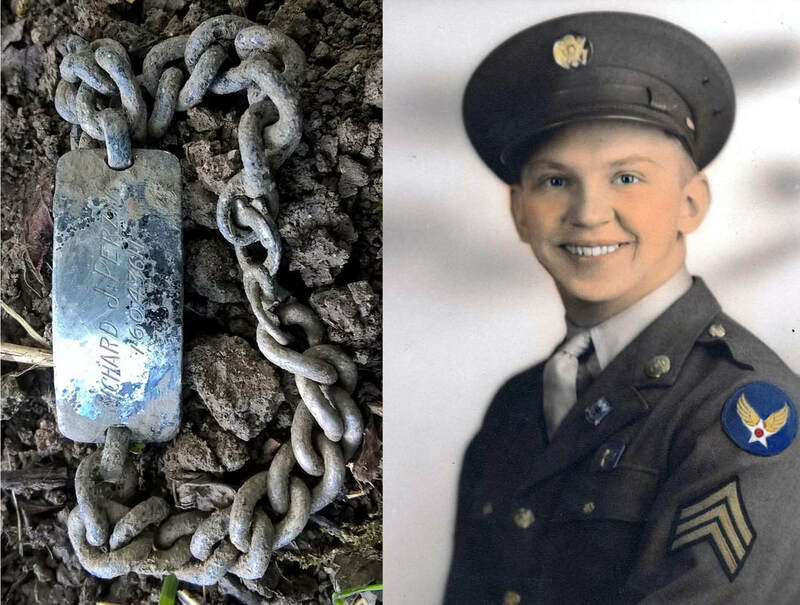 With the metal detector they went to the site of the crash and pulled out dozens of molten metal pieces that Faull Jr. took home. He was very emotional and moved. He also brought some earth from the land of Angels Camp, the Californian village where his uncle was born and dispersed this on the site. If you were available to take a trip we could ask the town to host you or one of us would be happy to host you. So please let us know. We're really hoping to see you soon. "Thank you so much for your kind note. 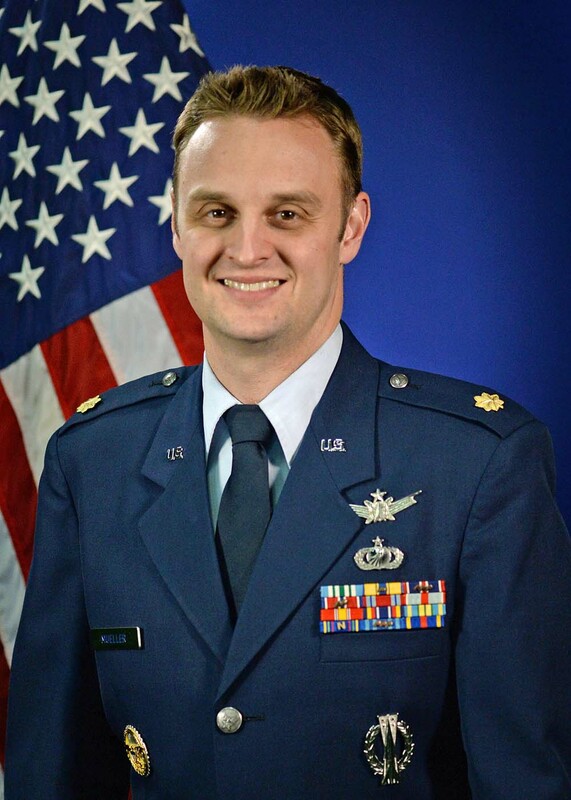 I am currently serving in the US Air Force so it really does mean a lot. My great Aunt recently gave me a metal tin with the effects Richard had in his wall locker. I put them in a frame and have it in my office. As for a trip out there, that sounds absolutely lovely. I will have to speak with Therese, Richard's sister and see if that is something she would like to do! When I was 13 my mom took me to Europe and we visited the cemetery in Florence where Richard was buried. 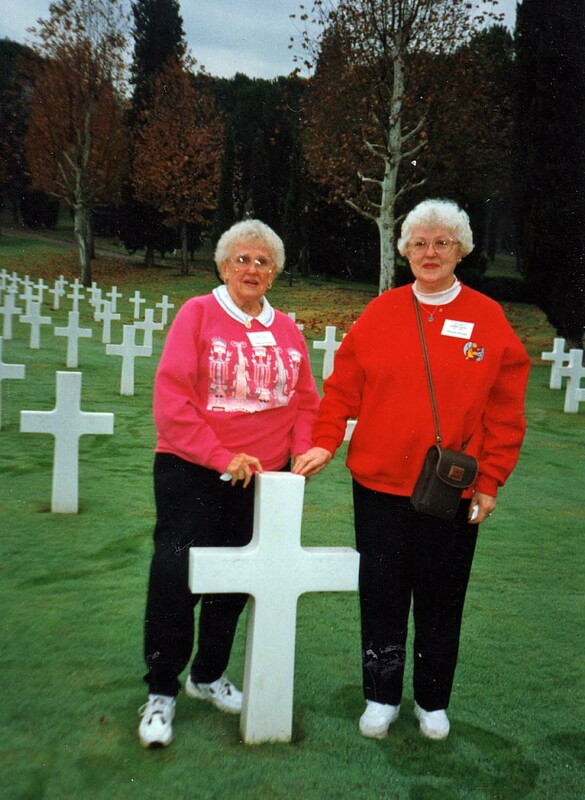 Many years later Therese and her sister Kay (my grandmother) visited Italy and Therese's church choir sang at Richard's grave. I have attached everything that I have. It includes all of the notifications to his mother after the accident, a note he wrote home with two photos of himself, one for his mom and one for my grandmother, excerpts from a journal my grandmother kept on her Italy trip relaying her time at the cemetery in Florence, the shadow box I put together with his effects, photos we took in 1993 when my mom and I were at the gravesite, and a current photo of me. I would welcome a conference call! Let me talk to my mom and my cousin Tim (whom I think one of you spoke with) and I will get back to you. I have included all of the Perzyk family on this email! Again thank you very much for the work you do! I hope we can arrange a meeting very soon. 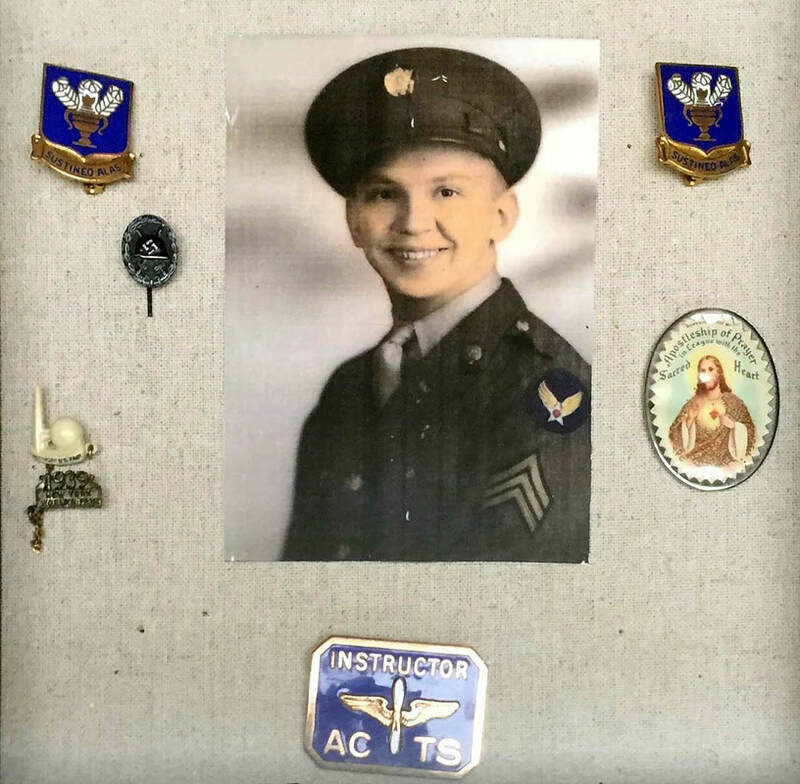 Jeff Mueller, Grandnephew of Richard Perzyk." 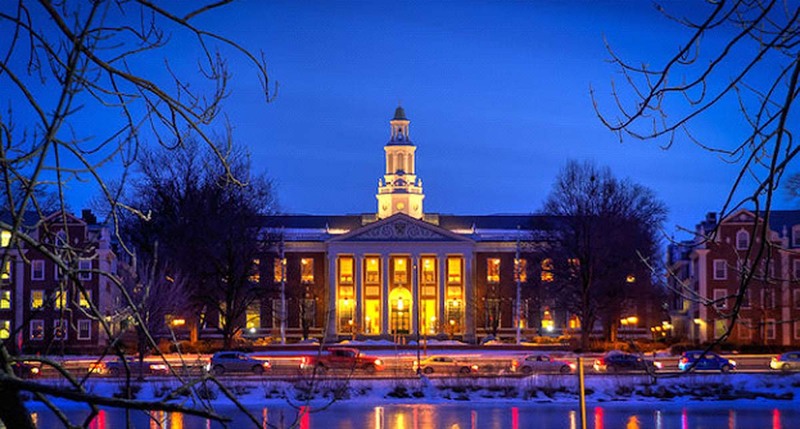 "Dear All , I am Piero , I am the one who opened the contact with Tim through our Harvard alumni connection . I am not a member of the glorious GRAC Team, but I am helping them through my contacts . We are trying to setup a conference call via my company facilities that would be on toll free number anywhere in the world so the more joining the better. In the meanwhile we are passing you a translated two pages(attached) from an old book which describes the event should anybody not have seen that yet . it s very touchy. So kindly let us have a date and a hour and we will fix the call . "Dear Piero and Friends, I am Therese Perzyk. Richard’s sister. I am the youngest member of the 15 siblings and the only one left. Here are a few items that you might want. I have his Baptismal Certificate. 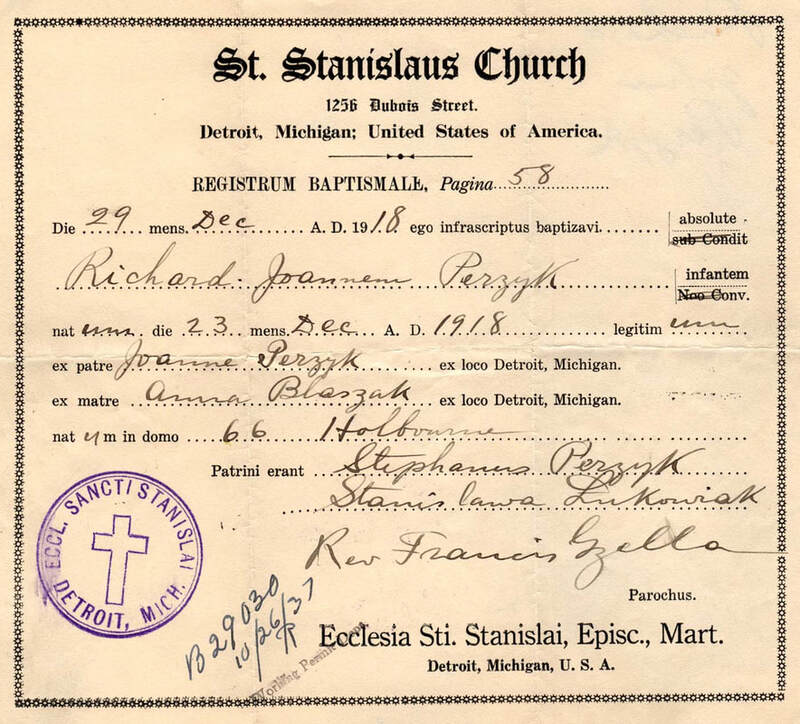 He was baptized at St. Stanislaus Church, Detroit M:, born Dec. 23, 1918, baptized Dec. 29, 1918. He graduated from Eastern High School, Detroit Mi. Not sure the year but if he was 18, it might have been 1936. School no longer exists. 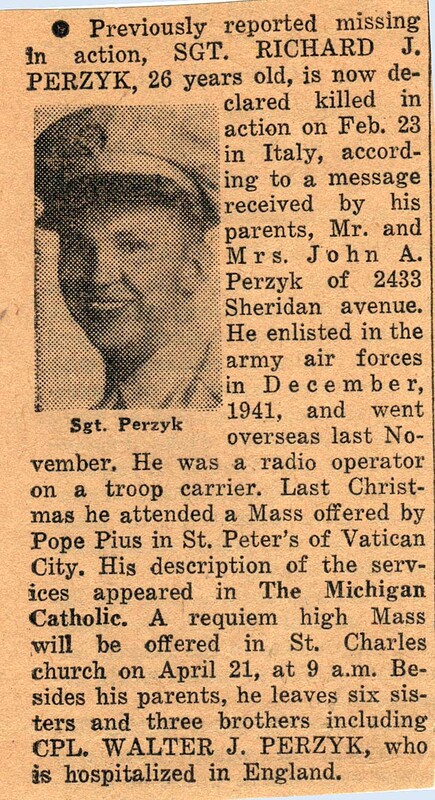 He was able to attend Midnight Mass at St. Peter’s in Rome Christmas Dec. 1944. My sister Clara sent a copy of his letter to the Michigan Catholic and it was published. I will call them today and see if they have it in their archives. Hopefully I’ll be able t find my copy. Recovery and ID letter from James F. Smith, Major, QMC, Memorial Division. All data my parents received lists Feb. 23, 1945 as his date of death. Richard was a great brother, gave me my first real leather ice skates. 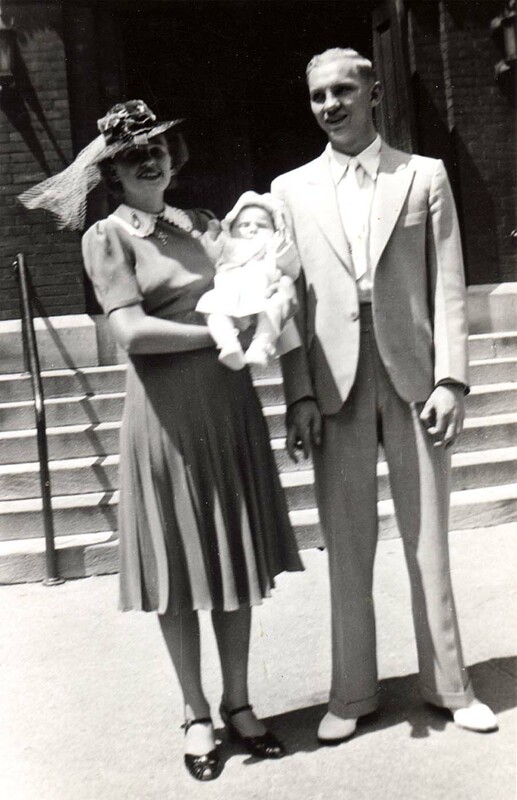 He also was a godfather to my niece Joann Greene, living. MY sister Catherine and I went to Florence in 1995 along with our choir from St. Lucy Church, St. Clair Shores MI and our Pastor, Rev. Bohdan Kosicki, now deceased. Maria Bonnani sang Ave Maria at the grave, and Father led us in prayer. The trip planners made it part of our trip. Everyone said this was the best part of the trip. I’m sure I have pictures from this. When I gather all my data will have Jane scan them and send them to you since my scanner is not working. I can’t thank you enough for all the work you are doing. "Dear Therese , first of all let me say it s a honour to get in touch with you . Thank you for the details hereunder , as mentioned we had an independent verification from an external source and now everything is confirmed , we really have no doubt of you being the real relatives . I read the notes during your trip to Florence and when it is said that you could feel his presence ,well then I thought that in a way this is also a sign where Richard has shown us his presence ! Just to introduce myself I am 52 , working in a bank in Milan married and father of 2 . As said we wish to fix a call so we can all introduce ourselves and plan the best and most honourable way to deliver you this personal item . What you have to bear in mind is that whilst we are your contact , there are plenty of other people who wish to see you shake hands and thank you for what your brother did . In essence a full village and many many authorities and personalities . That s why we really hope to see you soon . Knowing than that Richard was Catholic we will certainly wish also to organize a Holy Mass and a blessing in His memory in Zavattarello . So we remain waiting an available date and time for a call (this can be also during the weekend ) . In addition we kindly request your authorization to include the pictures and letters and data you have provided in the Grac web page to complete the history . 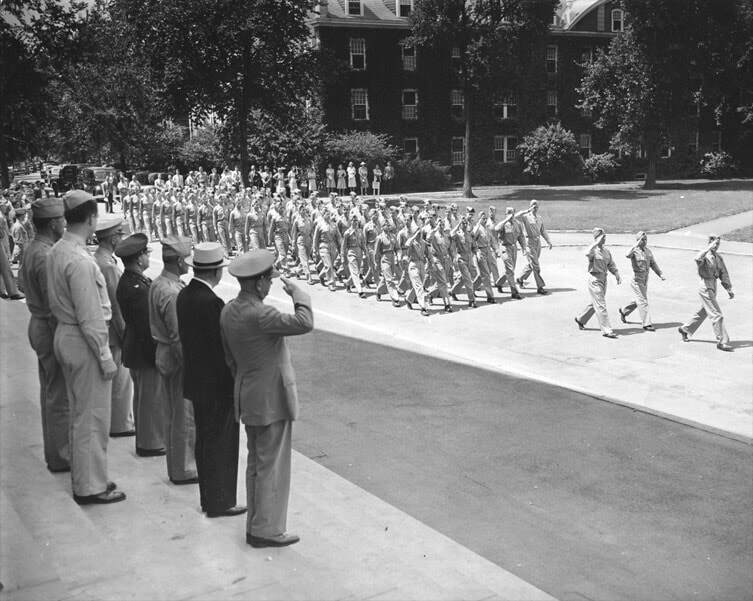 Please note that the website receive an extraordinary amount of visits from all over the world and in essence it is like a virtual museum for the benefit of the world and the new generations to maintain alive memory of events which have marked the evolution of our society with sacrifice of so many young lives. Piero Ricci on behalf of the Grac Team"
Thank you for the gracious note from you. Thank you for your research and the Grac Team for all they have done. There is hope for the world with wonderful people in it like all of you. I met with Jane yesterday and she scanned the additional items to be included in Richard’s website. I will have to send them separately as she sent them to me. 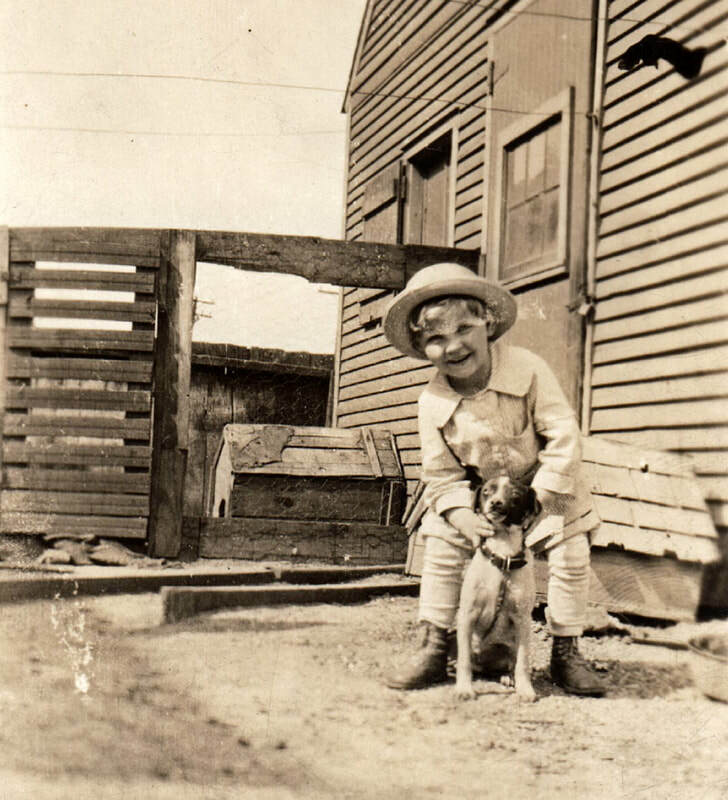 I am 88 years old and born WAY before computers. I hope they all go through. 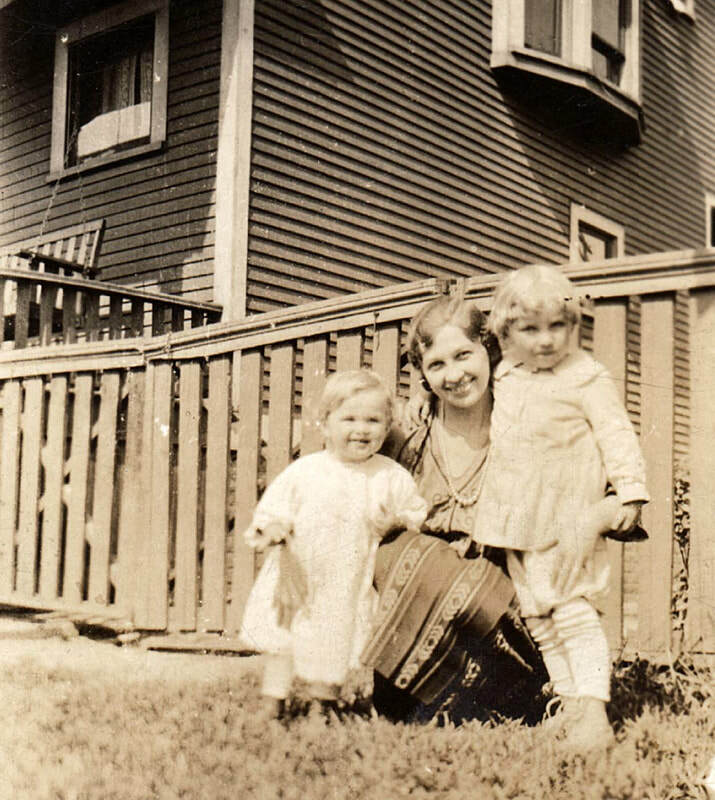 I also instructed my two great nieces (Jane’s daughters, Tim’s sisters) to call Tim and Jeff and have them decide on the day, time for the conference call and contact you as soon as possible. Once everything is finalized there may l be several family members traveling to Italy. 09 luglio 2017. Grazie a Piero, che ha coordinato il collegamento di chiamata collettiva, alcuni membri del Grac hanno potuto conversare con diversi famigliari di Richard, giusto per conoscersi e per organizzare la consegna del braccialetto del loro caro. La conversazione si è svolta in termini di gentilezza e gratitudine per quasi un'ora. 09 July 2017: Thank to Piero, a conference call was set up, some members of Grac spoke with various members of Richard’s family, to introduce themselves and to organise the delivery of the bracelet to one of them. The warm and friendly call lasted nearly an hour. "Buonasera, Piero! Thank you so much for coordinating the conversation earlier today. We are all so thankful for the outreach and look forward to next steps as a family. Per your request, below is a detail of the family members who joined the call, with reference to each individual's relationship to Richard Perzyk. We will discuss as a group potential travel dates in autumn (Oct) and reach out again to coordinate. Please let us know how the conversation with the mayor goes, and I believe Jeff will follow up regarding reaction from the consulate. I'll also work to get most of us on WhatsApp for easier text-based communication as the visit draws closer. "Piero, it was wonderful speaking to you today. You have been so gracious and helpful, we can’ t thank you enough. Our Detroit News had an article on the Editorial Page July 7, 2017, entitled “Italy, Detroit working together”. It was written by Armando Varricchio , ambassador of Italy to the United States. 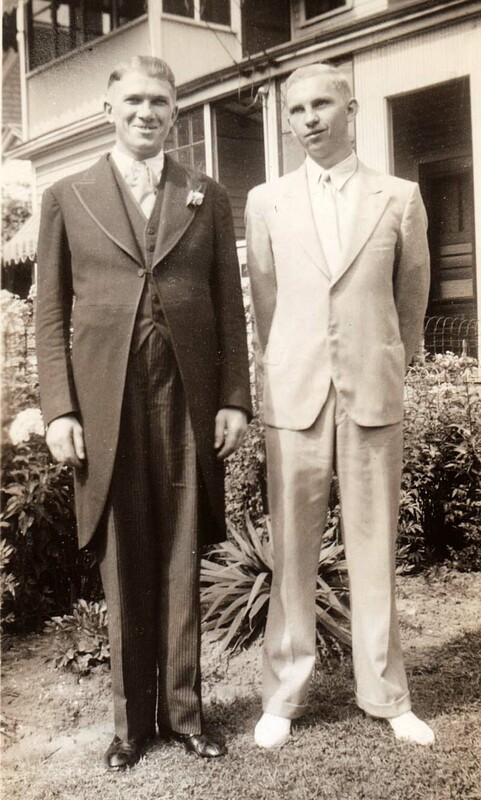 Great article, talks about the bond of friendship forged in the aftermath of World War II. I’ve been telling everyone that Piero and GRAC are my new best friends. We will be discussing travel plans soon. October is a great time to go. In 1995 when I went to Italy, it was end of October. Our choir director gathered some leaves for us to take home. I still have them.